Life Plan Communities are a retirement living option that encourages an active independent living lifestyle. By offering residents the benefits of independent living and a range of health services all within a socially active community, exceptional amenities and a unique and vibrant lifestyle, residents of our Life Plan Communities can truly live life to the fullest while having access to different levels of care if their needs ever change. Residents living at any Sun Health Community location as well as Sun Health At Home members are assured access to a full continuum of care under a Life Care agreement. Life Care defines your financial arrangement so that once you are either a resident or Sun Health At Home member, all levels of care will be provided—even if your financial needs change by no fault of your own or if you outlive your assets. While there is an upfront investment associated with a Life Care agreement, the savings and peace of mind for you and your family that comes with a Life Plan Community is significant. Every Sun Health Community location offers residents three agreement options for Life Care which include an entrance fee and monthly fee. With three life care agreements to choose from, there are options that can best fit your current health or financial situation. Sun Health At Home offers membership plans to accommodate a variety of needs, giving members access to benefits such as in-home functional and safety assessments, health and wellbeing services, social activities, and a full suite of health services provided through Life Care. Choosing a living option is an important decision, but with a Life Plan Community, it’s easier to decide knowing you’ll have access to all levels of care within the community you love, should you ever need it. Independent living: Individuals who do not need hands-on care and are able to manage daily activities without extra assistance. Assisted living: Individuals who can live semi-independently but could still benefit from day-to-day assistance. Memory support: Individuals living with Alzheimer’s, dementia, or other forms of memory impairment. Skilled nursing: Individuals with medical conditions that require moderate to total assistance with everyday life. Rehabilitation: Individuals recovering from injury, illness, or hospitalization. At Sun Health Communities, both residents and Sun Health At Home members receive access to many services that help encourage happy and healthy living. There is no waiting period to access your Life Care benefit, as it begins when you complete the Life Care agreement. Should you need additional levels of care (including assisted living, skilled nursing, memory support, or rehabilitation), that too will begin as soon as necessary, with a reduced need for additional paperwork or approvals. What are my agreement options for Life Care? There are two sets of agreement options for Life Care. Sun Health Communities offers three agreement options for Life Care: Traditional, 100% Refundable, and Full Health Benefits. Each option includes an entrance fee and monthly fee. We will help you identify the plan that is best for you. Sun Health At Home offers membership plans to accommodate a variety of needs and benefits such as in-home functional and safety assessments, health and wellbeing services, social activities, and a full suite of health services provided through Life Care. Does long-term care insurance provide the same benefits as Life Care? The goal of Life Care is to foster the best functionality as you age, providing the support you need in your existing community through all levels of care. Long-term care insurance is a premium that you pay to a company. Many long-term care insurance policies cover part but not all costs that may be associated with higher levels of care. Your policy may also require you to move if you need a higher level of care. In addition, if you are unable to pay your premiums, the company may cancel your benefits. With a Life Care agreement, you will continue to be covered even if you cannot pay your monthly fees. Is my cost fixed for long-term care coverage? The beauty of Life Care is the predictability of cost. Life Care helps effectively minimize higher fees when care is needed. Those insured by long-term care insurance policies cannot be assured all costs regarding their future care will be covered. Plus, premiums increase on all policies over time. At Sun Health Communities, all future premium increases are capped under your contract. 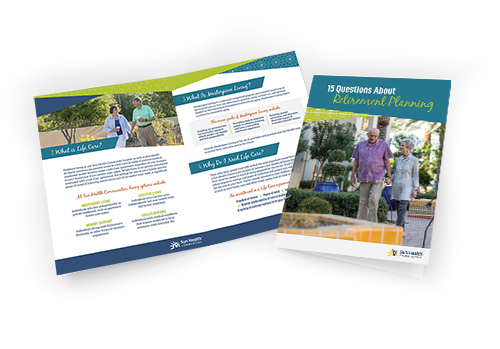 We’re here to help ensure that your next big life decision is an easy one with our comprehensive guide, 15 Questions About Retirement Living. Download it below for access to commonly asked questions, including what to expect, what your options are, and more.